If you’re like me, the transition to summer over the past month has been a welcome one! In Oregon, summer not only means longer, warmer days but also less wet stuff falling from the sky. Oddly though, summer also brings the biggest flows of the year in the tributaries to the Deschutes River. 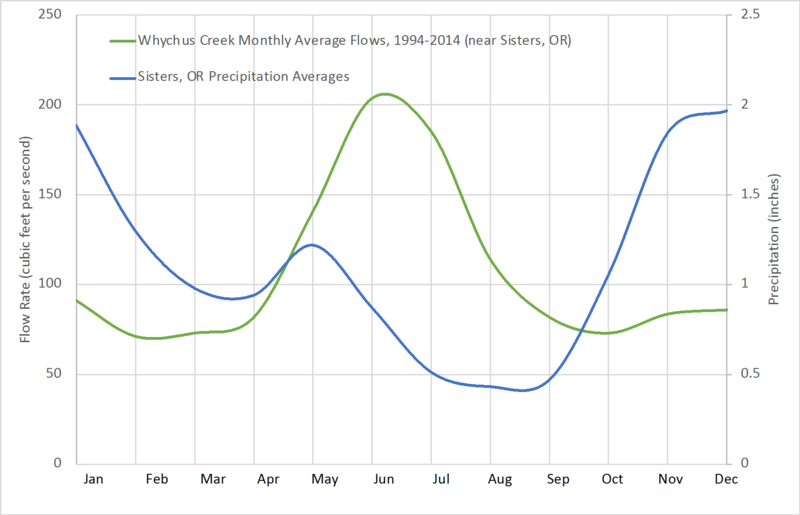 Take a look at the graph below, which shows the average monthly flow rate in Whychus Creek (near Sisters, OR) as well as average precipitation in Sisters. As you can see, precipitation is highest in November, December, and January, but flow levels are highest in May, June, and July. Why the disparity? Shouldn’t rivers be biggest when more water is falling on the watershed? It turns out the lag we see in peak flow timing compared with peak precipitation is because Whychus Creek (along with other tributaries to the Deschutes) is a snowmelt-driven system. This means that the majority of water in Whychus Creek comes from snowmelt, rather than rainfall. Though the snow falls on the Cascades all winter, it doesn’t begin melting until spring. Beyond allowing for a great spring and summer boating season (imagine if the best time of year to raft and kayak was in January…), the snowpack provides an extremely important service from an agricultural perspective. The growing season in Central Oregon happens to be in the driest part of the year, thus farmers rely on flows from local rivers to irrigate their crops when there is little reliable rainfall. The snowpack basically functions as a giant reservoir, storing water through the winter and releasing it slowly as it melts away throughout the warmer months when farmers need it most. Conversely, in rainfall-driven river systems (like those on the coast) there is no lag between peak precipitation and peak flow. This means that streamflows are very low during dry times of the year. 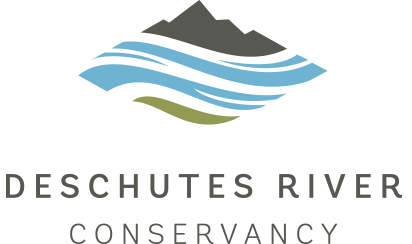 Climate change poses a major threat to the important water supply service provided by the Deschutes River Basin. As average temperatures rise, more precipitation will fall as rain, rather than snow. This means that snowpacks will be smaller, and peak flows will line up more closely with peak precipitation. Furthermore, a warmer climate will mean that whatever snowpack does exist will melt away more quickly. These dynamics will leave less water available in local rivers as the year goes on—bad for farmers who benefit from having water in the summer rather than the winter. Interestingly, peak flows on the Deschutes River near Bend occur a bit later in the year than on Whychus Creek. This is because humans have added dams and reservoirs on the Deschutes to artificially store water for release when it is most convenient. This approach helps to replace snowpack storage that is lost due to global warming, but it also has its own set of problems. We’ll dive into those in the coming weeks.